FLUXMETRE is composed of a cylindrical active sensor allowing a thermal solicitation of the studied material. 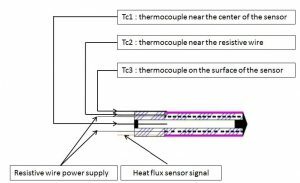 This heat flux device is based on the thermo-electrical principles in order to control and measure the thermal flux provided to the material. Thermocouples are disposed all along the device which allows a temperature measurement in different areas.